The time as shown for this flight (BAH to AKL) is 3:45 and the time appears to be in 24-hour format. Now, Does 3:45 here mean (the local time for BAH airport) which is 3:45 AM in 12-hour format? What about arriving time in which time zone will it be? I tried to look for an answer in emirates.com. Still nervous and confused, but I'm trying my best not to get lost. Times for flights are almost always given as local time in a 24 hour format. The departure time is given in the timezone of the departing airport and the arrival time is specified in the timezone of the arrival airport. In your example, the first flight is departing at 03:45 hours in the morning Bahrain time (GMT+3), from Bahrain. It arrives at Dubai (DXB) at 06:00 hours, Dubai time (GMT+4). 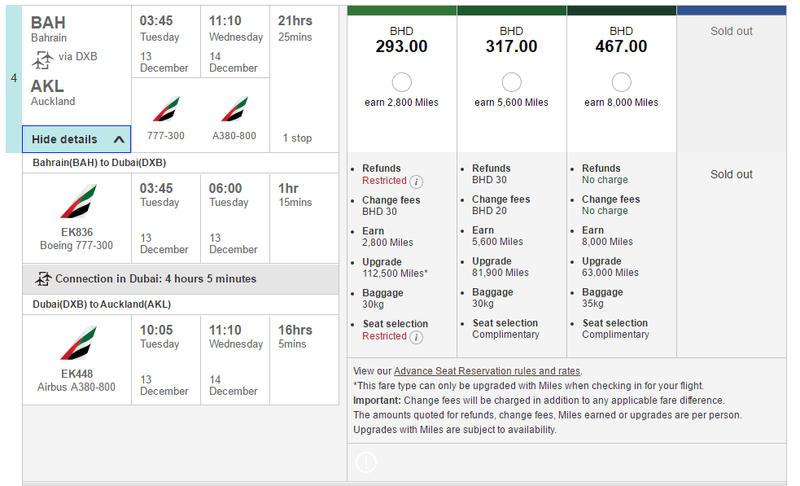 The next flight departs from Dubai at 10:05 that morning, GMT+4. It arrives in Auckland at 11:10 in the morning on the following day, GMT+13. The main exception to this is flights departing inside the United States, where times are given in a twelve hour format, with either an "a" to indicate before noon (a from ante meridiem) or a "p" to indicate the afteroon (post meridiem). If there is no letter then it is probably a 24 hour time, what the Americans sometimes call "military time". Not the answer you're looking for? Browse other questions tagged air-travel airlines bookings solo-travel emirates or ask your own question.